It’s summertime again, and that means sweltering heat and sizzling pavement. As humans, we typically are very good at adjusting to the increase in temperature, but what about our furry friends at home? Many pet owners immediately think of their dogs and heatstroke, with the yearly warnings to never leave a dog inside of a hot car. Our feline friends, however, can also feel the heat. Cats are fairly good at seeking out what they need to maintain a healthy temperature in the summer, but they need our help to let them do it. The ultimate masters of comfort can’t manage it alone. Increased tiredness... You’d suppose this would be hard to spot in a cat but it is often clear when you see it. Check the gums... So many health issues can be seen by a check of the mouth and this true in humans as well. Watch for gums that are a deep shade of red rather than the healthy pink. Distressed Breathing... If your cat seems to be struggling with breathing, is panting or hyperventilating, take note immediately. Increased heart rate... This coincides with distressed breathing and is also a major sign to watch out for. Pacing... This is often a manifestation of increased anxiety, but your cat may choose other signs of being “unsettled”. Should your cat be exhibiting any or several of the above signs, call your local emergency veterinary clinic to see if your cat requires immediate medical attention. Cats are quite adept at choosing the coolest spots in the house to relax, tiled floors, cooling air vents, porcelain sinks and the like. If you find them in these places, don’t dissuade them from being there, they’re just doing their best to regulate themselves. Keep in mind, however, that there are other ways that you can help them stay comfortable in the summer. Firstly, on the hottest days of the year, keep your cat inside the house if possible. If your cat manages to get out on their own, ensure that your yard has a cool shaded spot for them to retreat to and stay out of the sun. Inside the house your primary responsibility as a pet owner is to provide plenty of fresh, cool water for your cat to avoid dehydration and reduce their body temperature. In many cases, cats prefer to have several water sources available to them and also a moving source to keep the water oxygenated. Cats have enough difficulty being sufficiently hydrated as it is, increasing their risk of bladder infection, so it becomes doubly important on the hot days that your cat is encouraged to drink. Another tip: add an ice cube to the water dish for extra refreshment. Ice works wonders for cooling everyone down, including your cat. You can provide your cat with ice in so many creative ways, from adding a cube to their water dish, to letting them bat several cubes about the floor for fun or even giving them an ice and water snowcone! Your cat will love cool treats to keep them relaxed and refreshed. Aside from snowcones, another cool treat that you cat may enjoy is plain natural yogurt. Fresh from the fridge, this treat also helps your cat replenish their digestive-aiding bacteria, essential for high-protein diets. Another way to please your little furry friend is to freeze a can of their tinned cat food, then give it to them as a “popsicle” in their bowl. On hot days, cats often love the feeling of a cool damp towel rubbing over their fur. As cats do not sweat, this is a great way to cool their skin and keep their body temperature at a comfortable level. Your cat may also enjoy the feeling of a cool damp towel being left for them on the floor to lie down on. 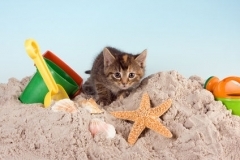 There are so many ingenius and fun ways to keep your cat cool, the list could go on. For more ideas, search online and talk to your veterinarian today.